Participants sing in an Iowa State University study to determine the activity's effects on speech and swallowing in persons with Parkinson’s disease. The study is led by Elizabeth Stegemöller in kinesiology. Contributed photo. Research by an Iowa State University kinesiology professor shows that music therapy can help nearly 2 million Americans suffering from Parkinson’s disease. Stegemöller studied the effects of singing on speech and swallowing in people with Parkinson’s disease, a progressive disorder of the nervous system that affects a person’s movement. Four groups of Iowans met for an hour each week, singing classic songs such as “You Are My Sunshine” and “Show Me The Way To Go Home.” A total of 30 people met in Des Moines, West Des Moines, Ames, and Waverly. Participants went to Stegemöller’s lab to be tested on voice measures such as pitch range and duration, and swallowing measures. Stegemöller then repeated the tests after eight weeks of singing, to see where participants made progress. The results: Participants showed significant improvement in pitch duration, vocal loudness, and swallow control after the two months of singing. L.K. Jordening of Ames said the therapy helped her ability to project her voice and breathe easier. Jordening joined the singing group in Ames after attending a forum at Iowa State. She said meeting new friends and being around others with Parkinson’s helped her to cope with having the disease. “If a person with Parkinson’s disease enjoys music and likes to sing, [the therapy group] is a way to do yourself some good and have fun at the same time,” Jordening said. 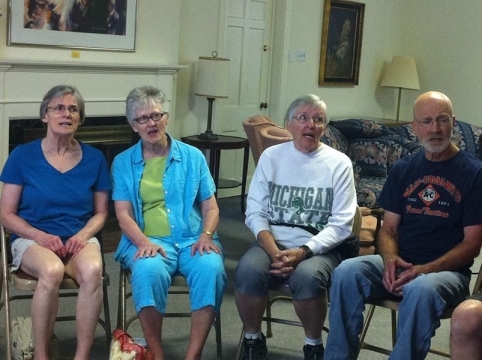 The eight-week study is over now, but the group in Ames still meets every Wednesday to sing. Stegemöller said she has seen an increase in participants’ social activity as they continue to meet. Stegemöller plans to conduct a follow-up study this year with the same participants for a longer 10-week period. She said her hope is to get all 40 participants back to the lab — including those who haven’t been singing and those who have. Elizabeth Stegemöller, an assistant professor in kinesiology, is using music therapy to help people with Parkinson’s cope with the disease.